Confession: I’ve never been to Hawaii. I feel like I’ve been to quite a lot of places in the world, but for some reason I never made it to Hawaii. I don’t know why because I feel like I would fit right in. Hawaiians are known for their love for spam and I love spam! They grow pineapples and I like to eat pineapples. They’re obsessed with poke, and I am too! I cannot wait to taste authentic Hawaii poke because I’m pretty sure that I’ve butchered this beloved Hawaiian favorite. I didn’t want to mess with it too much, so I based my recipe off of my dear friend, Alana, who is Maui born and raised. I peppered her with a ton of questions like, what is limu and can I add crispy onions? Limu is a sort of seaweed (technically algae) and apparently adding crispy onions is kind of like sacrilege. But Alana said that I could call this mainland poke and kind-of-sort-of get away with it? Thing is, Alana was right: poke does taste better on rice! But maybe that’s just because I’m a rice fiend? The quinoa was pretty good too but don’t let any Hawaiians know that I think that. How about you guys, do you have any poke rules? In a small bowl, whisk together the soy sauces, sesame oil, ginger, and garlic. In a separate, appropriately sized bowl, gently toss together the tuna, green onions, and diced onion. Add the soy sauce mix to the ahi and toss until evenly coated. Cover and refrigerate for 1 hour minimum. 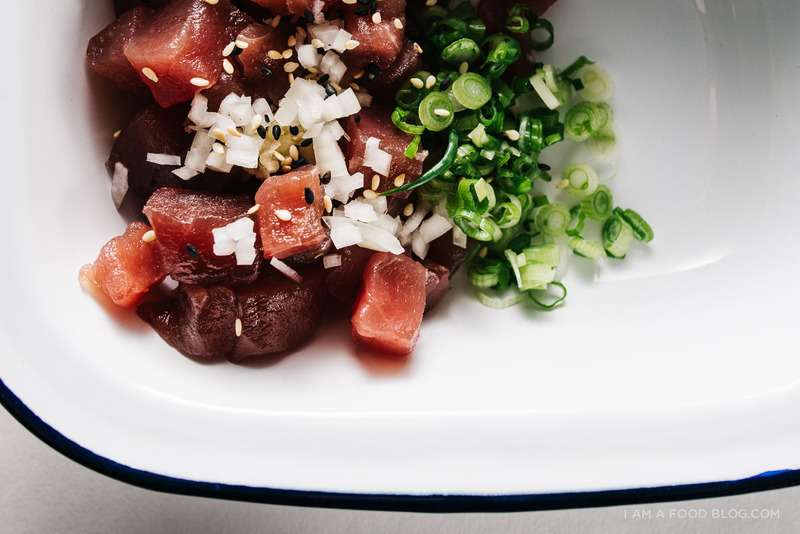 When ready to serve, taste the poke and adjust the seasoning as needed with extra soy sauce, sesame oil, and smoked sea salt. Scoop out an appropriate amount of rice or quinoa into bowls. Add a generous amount of poke to the bowls and sprinkle on sesame seeds. 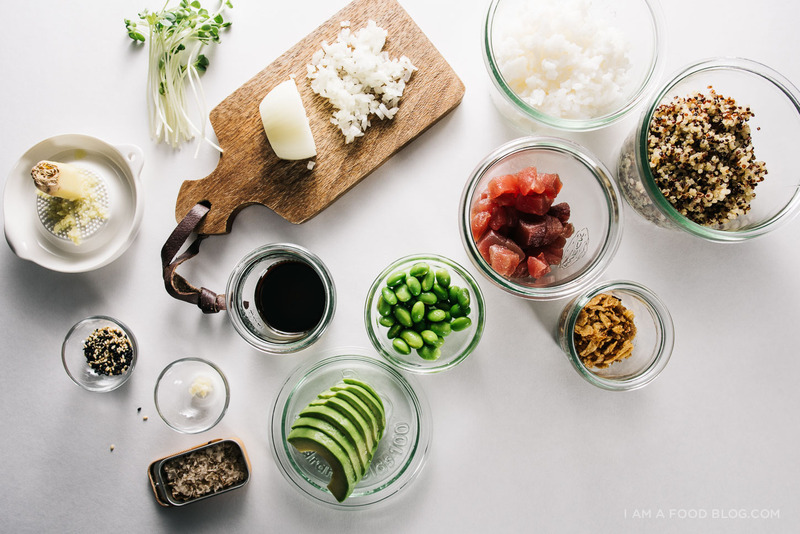 Finish the bowls with avocado slices, edamame, sprouts, and crispy shallots. Enjoy! We looooove ahi poke! It is one of the first things we ever made for our blog. It’s extra yummy if you add a fresh seaweed salad! quinoa sounds like an interesting base! i’ve never seen that one at any of the shops. 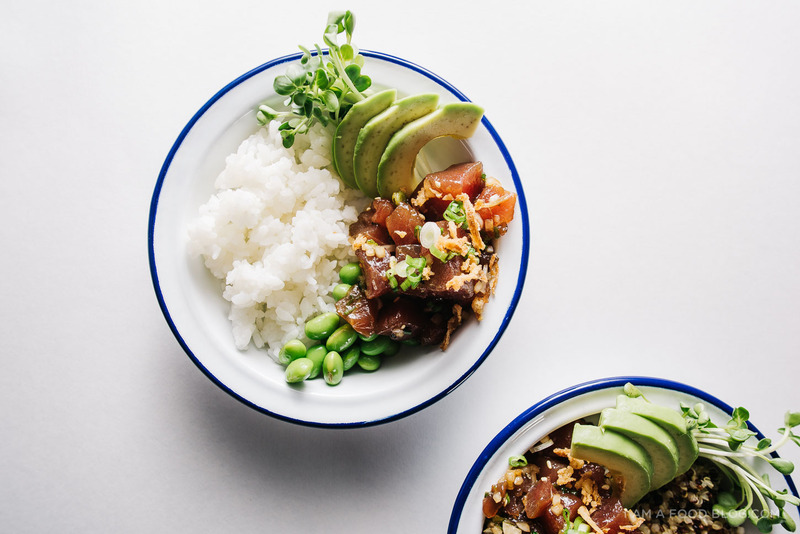 i love poke over a mix of rice and greens, and one of my favorite things to have in poke bowls is roe- it adds such a nice salty pop! 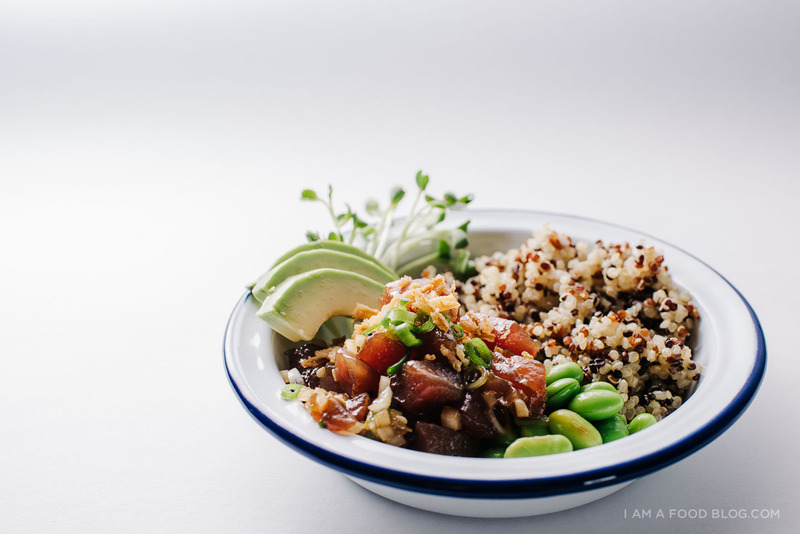 I’ve been hearing so much about poke recently, and I definitely like what I hear! I’m a long way off from Hawaii, but maybe if I make this and close my eyes then I can imagine that I’m on a sunny beach instead of in rainy England! 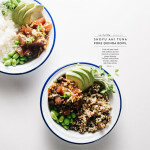 This looks super delish, and personally, I love that you used quinoa instead of rice. Don’t worry, I won’t tell the Hawaiians! This looks amazing! I’ve never been to Hawaii either… it’s definitely up there on my travel list!! GET TO HAWAII GIRL! 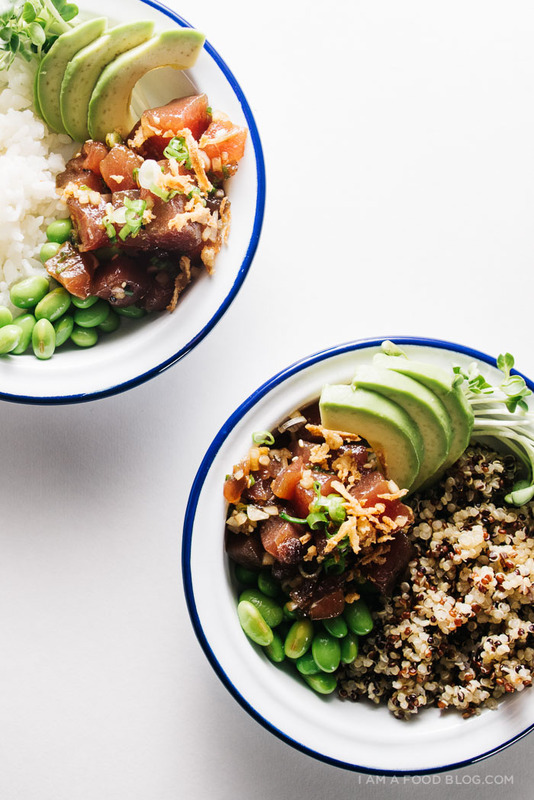 Seriously, I lived on poke on my honeymoon in Kauai (and also teriyaki FRIED chicken. dead). I love poke so much, these photos kill me. 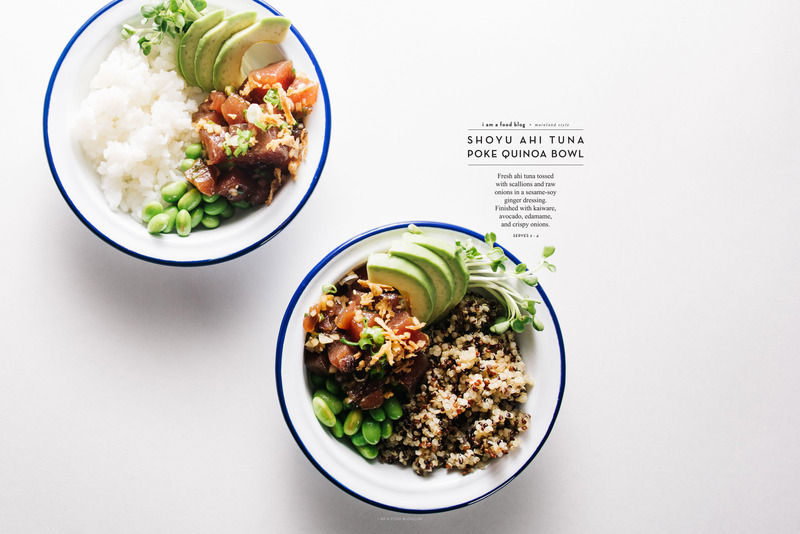 these pictures are so gorgeous and the poke bowls look so fresh! I love it. I love poke too but have never made it. You HAVE to go to Hawaii now! :) They actually have poke at Costco that I’ve purchased before and it’s pretty good. I am printing this out now and will be making it sometime soon–we have an awesome fish market in Berkeley that has sashimi grade fish so oftentimes we will have a sushi night. Thanks! haha serving it on quinoa is probably sacreligious but hey the poke looks so tasty who cares! Looks good. You can also substitute the AHI with Salmon or Hamachi(Yellow tail). Winnahs! Healthy and looks tasty. Definitely going to make this soon. Any reviews from anyone who has made the recipe?? Oh my god! Do I love this chic or what!! I just found this blog today!! im a blogger too and i have to say : this phoyography is perfection! Love!